We all know that cable is overpriced and that cutting the cord can save you hundreds of dollars. But just how much more does that cable subscription cost you? The average low-tier cable package costs you about $65 per month, or nearly $775 per year, and gets you 189 channels, of which you likely only watch about 17. That means that you’re paying about $0.40 per channel. But when you really do the math, you’re paying per month upwards of $3.68 per channel you actually watch! 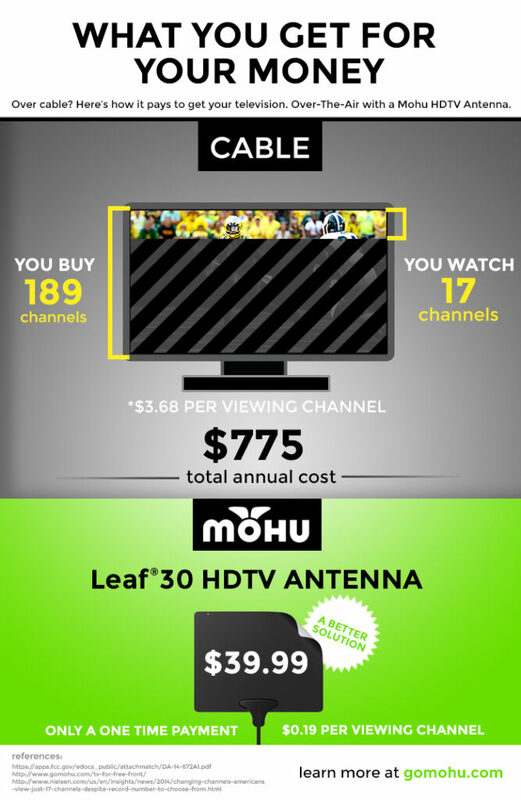 In comparison, with your Leaf 30 antenna, you can pull in an average of 53 channels at a total one-time price of $39.99 (a.k.a. no monthly bills attached). That means that you’re looking at a mere $0.06 cents per channel over a one-year span, and the cost continues to diminish over time since you only have the one-time cost of buying the antenna! To offer a fair comparison though, let’s assume you’re still only watching 17 of those channels – the math is still significantly below the cost of cable at $0.19 cents per channel watched. Even if you chalk up a little extra cash for the Leaf 50 HDTV antenna, you’re still looking at significant savings compared to cable. At an average of 56 channels with the Leaf 50, you’re looking at just $0.09 cents per channel and $0.29 cents per channel watched. Here’s a visual breakdown of how much you overpay for cable, just how many channels you realistically watch, and how much each of those channels are costing you. With cable, you’re paying nearly $775 a year for 189 channels and yet you’re only watching 9% of them. Why keep overpaying for channels you don’t watch? Find out how much free TV you can enjoy with an indoor HDTV antenna and start saving.